BSAFE, Brandon University's new safety app, offers tules and information to help students, faculty and staff feel and stay safe. BRANDON, Man. – Brandon University (BU) students, faculty and staff have a new safety tool, and they’re likely to carry it everywhere they go. The University has launched BSAFE, an app available on Apple and Android platforms that provides members of the BU community, on campus and elsewhere, with safety aids and information that’s just a tap away. Users will be able to contact security and emergency services through the app, as well as find links to information on safety procedures, counselling supports and updates from the University. The BSAFE app takes advantage of connected capabilities to also offer immediate info alerts from BU to all users. These push alerts can notify the BU community in case of power outages, severe weather warnings or other emergencies, providing up-to-date information directly to the user’s device. Available from the App Store and the Google Play Store, BSAFE was developed for Brandon University by Toronto-based AppArmor, which has produced safety apps for universities across North America. Its features include the innovative Friend Walk, which allows users to remotely chat with a friend who is also able to monitor their location in real-time on a map. Location data is only shared temporarily. “The exciting part about Friend Walk is that it works anywhere you can get a signal, so any of our students in Brandon, Winnipeg or Dauphin could use it while they walk home from campus or work, or a faculty member could use it while attending a conference in an unfamiliar city,” Neal said. New students were introduced to the app as part of Orientation. The promotion of the app to students, faculty and staff will continue over the coming weeks as part of the University’s efforts to make all members of the BU community start the new academic year by feeling at home and comfortable in their surroundings. 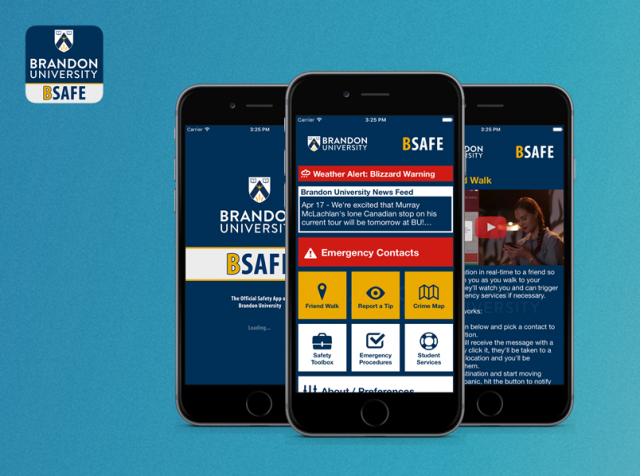 As use of the app expands, Brandon University will look at adding new features beyond safety that will make BSAFE indispensable for everyone at BU.